Two weekends ago, I took the family back to Batu Gajah for "Qingming" or "Ching Ming" Festival. My wife's family members were gathering for Qingming. Qingming is essentially the honoring of ancestors or ancestors memorial day, where family members gathered together to visit, sweep and clean the tomb and grave sites. 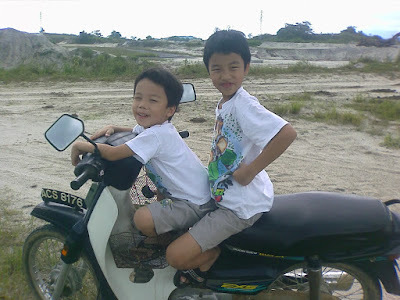 During the visit to the grand parents' kampung (a small village), I took the opportunity to take the kids motorbike riding around the old tin mining "wasteland", which practically surrounded the whole kampung. 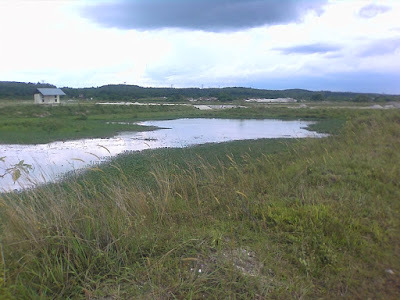 The "wasteland" of Batu Gajah. Made me feel like I am playing my Fallout 3 game... LOL. 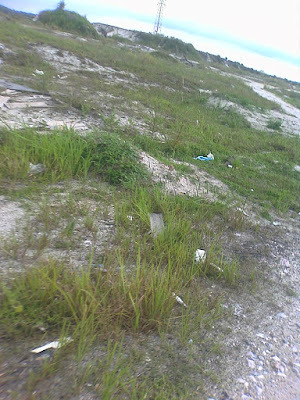 Another pix of the "wasteland" that only scant of vegetation can survive. The boys (Jordan and Joel) happy as can be to be able to ride on a motorbike... Hahah. The kids had a grand time. They wanted more but unfortunately, it started raining and we had to head back. When we reached the grand parents' house, we managed to catch an ice cream seller on motorbike. Needless to say, they two boys were screaming for ice creams. 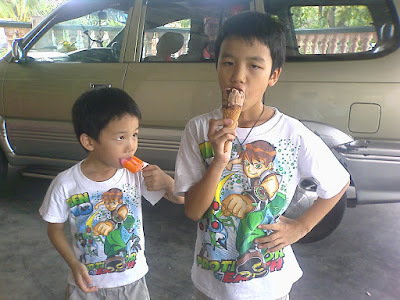 After the ride, back at the grand parents' house, Jordan and Joel had a popcicle each as a reward for behaving. In the end, it was ice-cream for everyone.... including the grand parents... LOL.